I had the spirit-soaked pleasure of attending an unconventional convention that just celebrated ten years in New Orleans. The birthplace of all good things and a few things even better, The Big Easy hosts a raucous spectacle every July in the stickiest, funkiest heat called “Tales of the Cocktail.” Thousands of enthusiastic revelers take over the Hotel Monteleone and the surrounding area to celebrate all things boozy. The crowd consists of bartenders, writers, distillers, brand representatives, artists, afficionados… every kind of boozehound you can imagine, and several more you can’t. 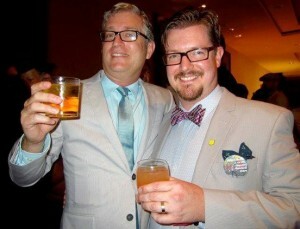 At right, that’s me with bud Chris Bostick, General Manager of The Varnish in Los Angeles, just before he and the rest of the crew won the Spirited Award for Best American Bar. Not too shabby. The events range from elaborate sprawling spectacles hosted by the world’s biggest brands (with budgets to match), small private parties and product-launch tastings, concerts, competitions, and seminars. Those seminars will get as cocktail-geeky as you want, and I savored every minute of subjects such as Stephen Crane and the history of the Luau restaurant in Beverly Hills as presented by Martin Cate of Smuggler’s Cove or the history of drinking in Panama presented by cocktail historian David Wondrich and tiki guru Jeff “Beachbum” Berry. It was a kick to sit outside the pop-up shop run by Octavia Books and sign copies of my book for a handful of attendees and chat about what they like to make at home. The previously-clandestine “Pig & Punch” hosted by The Bon Vivants made its official coming-out this year, and for my money, it was the best party there. Nine whole pigs, rotisserie barbecued and pulled to smoky perfection, six trash cans full of punch, a brass band, and impromptu soccer games with some neighborhood kids made for a little slice of magic. The week-long party caps off with the annual Spirited Awards, honoring the best in the business as determined by a panel of respected peers. My little pocket book was nominated for “Best New Cocktail Book” alongside the best, including: gaz regan‘s “Annual Manual for Bartenders,” Brad Thomas Parsons‘ “Bitters,” and the shoe-in winner, Jim Meehan‘s “PDT Cocktail Book.” Believe me, just being nominated was more than I ever expected, and all the recognition I need! Running into David Wondrich and Simon Majumdar at the Napoleon House while sipping a Pimm’s Cup with my wife Kristin and our friends Paul Imbesi (of Barritt’s Ginger Beer) and Paul Harrington, all of us seeking a quiet spot away from the insanity of an overflowing party a block away. Trekking out to the historic Bywater neighborhood on a quest for New Orleans’ best Po-Boys (as recommended by Chuck Taggart), then heading across town to wander the Lafayette Cemetery #1. In the calm before the storm, Matt “RumDood” Robold, Daniel Djang (Thirsty in L.A.) and I shared a religious experience at Willie Mae’s Scotch House, where humble fried chicken and red beans & rice are elevated to otherworldly perfection. So what’s the takeaway from Tales of the Cocktail for the home enthusiast? The popularity and visibility of this new “Golden Age” of cocktailing we find ourselves enjoying doesn’t just benefit bars in the big metros anymore. Previously hard-to-find products like imported liqueurs, fancy bitters, and craft spirits are becoming easier to find across the country, making it convenient for home bartenders to try their hand at a wider range of drinks and to have more fun discovering new favorites. If you’re curious, there’s a recap video showing what it was all about here – and of course, all are welcome to attend. Check out the official site and come on down for the party! p.s. It wasn’t all fun and games, and I would be remiss if I didn’t mention that on the opening night of Tales, the bartending community lost someone special: Jenna Bredesen, who worked with Audrey Saunders at Pegu Club in New York and as a cocktail ambassador and educator for David Kaplan & Alex Day’s Proprietors LLC project in Mumbai, India. Just 27 years old, she passed away in an unfortunate accident away from the official events and her death cast a sobering, uneasy shadow over the festivities for those who knew. A tragic reminder to look after each other and ourselves. Donations in her memory can be made to Oceana.org. Tempting as it may be, odds are you can’t dedicate an entire room to your home bar. 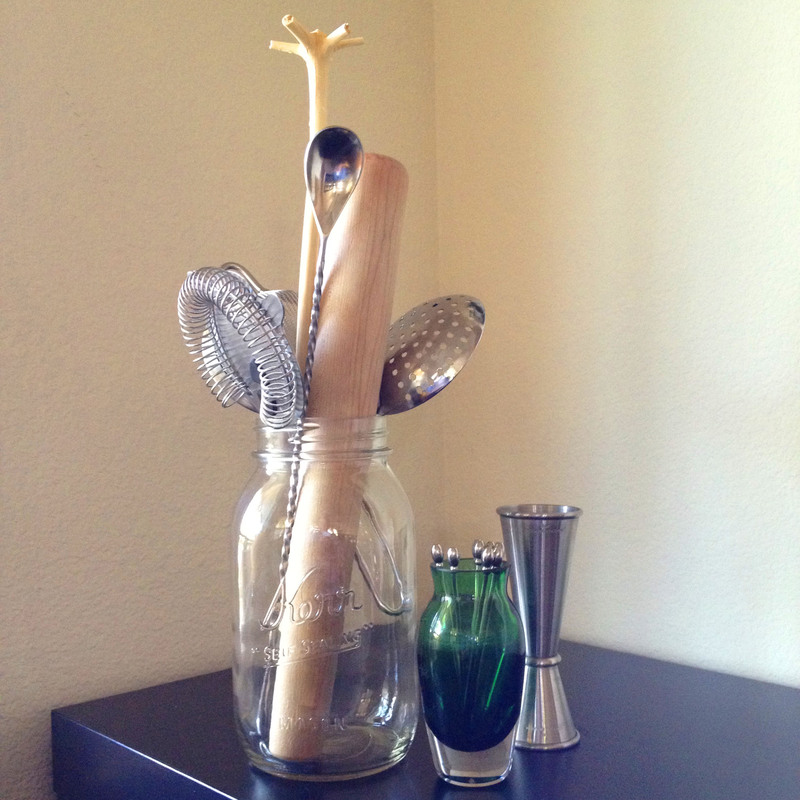 Most people make do by sticking bottles wherever they’ll fit, mixing cocktail glasses in with everyday glassware, and storing bar tools in a silverware drawer. I think it’s a shame to hide all those cool-looking bottles and hardware out of sight, plus there’s a benefit to having them visible: it’s a signal to guests that you’re a prepared host who is on standby 24/7 to show friends and family a good time. But that doesn’t mean things have to get out of control. I’ll start with the assumption that you’re working with a limited space and a limited budget…. Any space near your kitchen or mixing area that can be set aside can be made into a dedicated home bar, even if it’s just a single bookshelf or a section of your counter. If you have the area, look at employing a sideboard or buffet as your home bar central – you can display bottles and tools on top, store glassware and extras underneath. 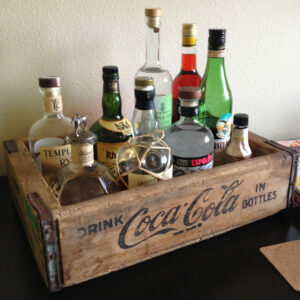 A rolling bar cart works well for tight spaces, and can be wheeled away as needed. For the tightest spaces, a single vintage crate can be a cool way to group together a compact collection of bottles and keep things looking tidy. A well-secured shelf can work in a pinch for a dozen or so bottles – just make sure it’s rock-solid and level. Avoid that hot, greasy, dusty area over the stove or any spots that get heavy direct sunlight. Your booze won’t spoil, but it will evaporate – and mixing cocktails with overly warm spirits will dilute your ice faster, making for a watery drink. Only keep on display the bottles you use day-to-day, and keep any extras in a dedicated “overstock” area out of sight. You may even consider rotating your selections seasonally – rums and tequila in the summer, whiskey in the fall, for example. Wherever you wind up keeping your bottles, group them together by family so you can find what you’re looking for easier: whiskies, gins, rums, and so on. One of each basic spirit (bourbon, rye, Scotch, light rum, Old Tom gin, London Dry gin, brandy, tequila) and basic liqueurs (triple sec, Herbsaint, Drambuie) is a good rule for tight spaces and allows for flexibility depending on your mood or your guest’s preference. Always store vermouths (Italian and French) and syrups (simple syrup, grenadine, orgeat, etc.) in your refrigerator to avoid spoilage. Getting good and plentiful ice at home can be a big challenge, especially if your freezer doesn’t have a built-in icemaker. Honestly, the ice that comes out of the icemaker isn’t all that great anyway. Use Tovolo trays for perfectly square cubes – just make sure you keep an open box of baking soda in the freezer to help absorb odors and try to keep the stinky things away from your ice (unless you like a garlic Manhattan – and if you do, I don’t think we can be friends). Once the ice cubes are set, remove them from the tray and store in an airtight container to avoid that silicon-rubber stink, and to keep the supply coming. If you’re very tight on space in the fridge, consider getting a few of those resealable narrow glass flask-shaped bottles for storing vermouths and syrups. You can squeeze a lot into a small area with those, maybe even just one shelf on the refrigerator door for everything. Label and date your bottles to help keep an eye on freshness. Your basic kit of bar tools should be stored in sight – shiny silver and sparkling glass look great and indicate you mean business. 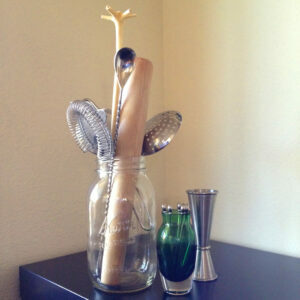 A sturdy mug, jar, or low vase can hold everything except your jigger, shaker, and mixing glass. Always have a few fresh lemons and limes on hand, maybe an orange and a grapefruit. Keep them in the same area as the rest of your home bar setup for a punch of color. There’s some debate about refrigerating versus storing at room temperature – they can go from fresh to moldy overnight if the room is warm (rotate them around the bowl to get a bit more life out of them), but they’ll dry out and get bitter if left in the fridge too long. See what works best for you and your home environment. I like to keep four of each glass on hand at a minimum (Old Fashioned, Collins, cocktail or coupe). Glasses should be stored upside-down in an enclosed, dust-free spot so you don’t have to clean them each time before using. Locate your nearest professional restaurant supply for bargain prices on great-looking glasses like the Libbey 3773 coupe, the Libbey 124 Old Fashioned, and the Anchor Hocking 3181EU Collins. Cruising around local thrift stores, yard sales, estate sales (or shopping online at Etsy) can be an affordable and fun way to decorate and organize your home bar. 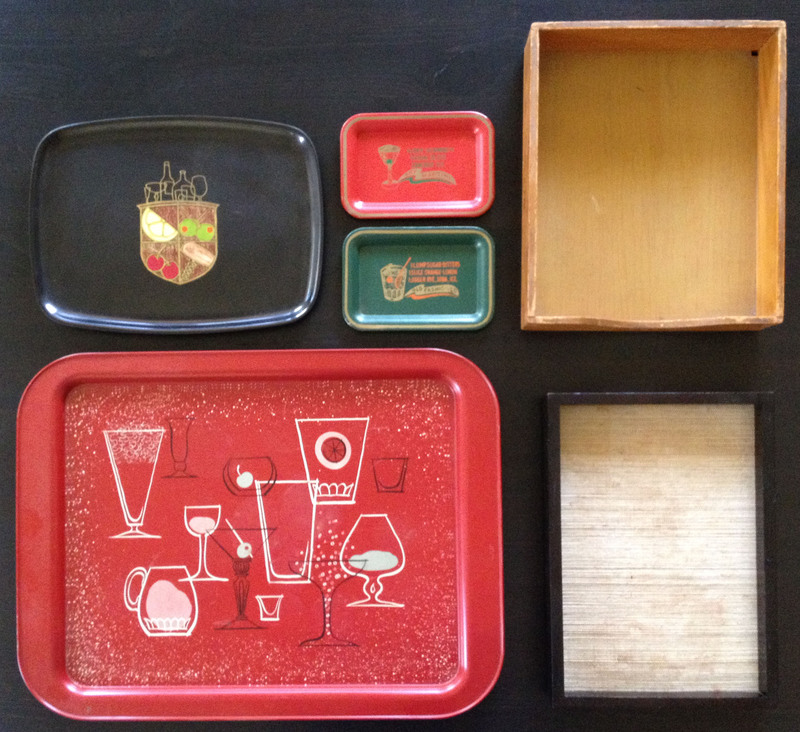 Trays of different sizes are great for creating order out of chaos, for carrying drinks or supplies from one room to another, and doubling as decorative items when not in use. At thrift stores, you’re sure to find treasures like vintage glass punch bowl sets, antique glasses, bowls for serving snacks, stir sticks from long-gone restaurants, or kitschy tchotckes to complete your scene. Got a great-looking home bar you’d like to show off? Email me some pix – I’ll choose some favorites to feature at the end of this article and on the Home Bar Basics Facebook page. Just hidden behind the floor-to-ceiling cases of Cuervo Gold is a diverse and fragile world of mezcals deserving your attention – sipping spirits on par with fine Cognac or Scotch; mixing spirits that are affordable and rewarding. As rum is made from sugarcane (and its derivatives), as bourbon is made from corn (mostly), mezcal is made from agave. Not a cactus, not an aloe – agave is a succulent with over 200 varieties that grow from the southern US down to Colombia and Venezuela, including the Caribbean. The bulk of agaves harvested for mezcal grow in and around the southern Mexican state of Oaxaca (say it “wah-HAWK-ah”). In the wild, agaves mature at around eight to twelve years, sending up a cluster of blossoms on a tall, asparagus-like stem called a quiote. Nectar-feeding bats fly from plant to plant, pollinating as they go. These pollinated flowers produce thousands of seeds, then the plants die as they regenerate scores of little baby agaves. The recent explosion of interest in mezcal and tequila has forced a situation where some producers interested in standardizing their spirits are looking to speed up the process by manually pollinating ahead of the game, cutting out the natural process. Unfortunately, this could have a long-term negative impact on agave, by reducing biodiversity and eliminating the habitat of the pollinating bats. Before the Spanish Conquest of Mexico around 1520, natives made pulque – a thick, milky, lightly-intoxicating drink made by fermenting the sap of certain agaves. When the Spanish brought the hardware and the know-how for distillation (that they, in turn, learned from their travels to Arab countries), focus was shifted to the starchy pulp of the agave heart and the first, rough mezcals were created. The agaves used for mezcal take between six to twelve years to mature, depending on their variety, the weather, their elevation, their soil – and like the “terroir” of fine wine, all these factors influence the final nose and flavor. Although automation has come to some mezcal producers (using harvesting machines and stainless steel autoclaves), the old ways still hold fast. When mature, cultivated or wild-growing agave plants are stripped of their leaves and dug up. Not an easy task – they can weigh as much as 220 pounds! Gentler mezcals are steam-roasted in hornos – large brick ovens. For a smokier flavor, a large pit is dug in the ground and lined with red-hot river rocks and a mix of cypress and mesquite wood for smoke, then loaded up with split agave “piñas” (as the hearts are called – they look like pineapples when cut), which are then insulated with agave leaves and straw. The insulation creates an earthen oven, and the piñas are left to roast for a few days, then dug up and ground to a pulp under a stone wheel (“tahona”) or shredded mechanically. The resulting thick liquid mush ferments in open vats for a few more days (as long as a month), and is finally distilled in alembic or pot stills – sometimes even rustic clay pot stills. You’ll usually only see “joven” (unaged) mezcal – occasionally, it’s aged for less than a year, called “reposado” (rested) or longer, called “añejo” aged. Tequila is simply a type of mezcal, just a very tightly-controlled mezcal. Where mezcal can be made from any kind of suitable agave grown anywhere in Mexico, tequila must come from the Weber Blue agave and must come from from the state of Jalisco (or a small handful of surrounding states). Sort of like how Champagne can only come from the Champagne region of France (otherwise it’s called “sparkling wine”). 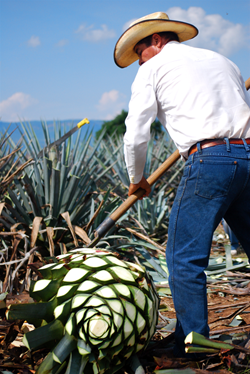 Typically, the Weber Blue agave hearts are roasted in hornos (no smoke like mezcals) and tequila is typically distilled longer than mezcal, making for a softer flavor – and can be sold straight from the still as “blanco” or “plata” (white or silver), aged two months to one year as “reposado” (rested), aged one to three years as “añejo” (aged), or aged beyond three years and called “extra añejo.” Aging takes place in oak barrels, usually leftover from aging bourbon or other whiskeys. Always, always make sure it says 100% agave on the label – otherwise, you’re getting that cheap mixto swill (made from part agave, part whatever). To be clear, that’s not to say all 100% agave tequilas are great (they’re not) but that should be your baseline to start. Tequila was originally imported to the US in the late 19th century as a health tonic (still works that way, if you ask me). It wasn’t until some anonymous and wonderful person hit on the idea of making a standard “sour” cocktail with it in the 1940s that tequila began to catch our attention – and began the long, slow slide into the pop-culture tar pit it’s currently drowning in: “mixto” sold by the jug, slushy machines, and chemically green sour mix. Meanwhile, fine mezcals continued to be made in the villages of Oaxaca and enjoyed by the locals while the gringos up north choked down rotgut tequila with a dose of salt and a bite of lime to deaden the palate. It stayed that way until the 1990s, when New Mexico artist Ron Cooper visited Oaxaca, tasted these amazing spirits, and made it his mission in life to bring them to the world, creating the Del Maguey brand. Del Maguey sources mezcals from individual villages, each one with its own unique character. Following his lead, there’s been an incredible surge in handcrafted mezcals available to the rest of us – from just a handful a few years ago to over 150 brands today. Note that unlike tequila, mezcal can only be exported in individual bottles (never in bulk), so what you’re getting is an artisanal product, straight from the source. There’s another esoteric agave spirit, bacanora – essentially just mezcal made in Sonora, so it falls outside the regulations governing true mezcal production. There’s only one brand available in the US at the moment, Cielo Rojo. Similarly, raicilla is made from agave around Puerto Vallarta, on the coast of Jalisco, and is roasted in hornos like tequila. The first thing you’ll taste in most popular mezcals is the smoke, reminiscent of a campfire in the desert on a warm summer night. But let your palate adjust – what follows can be a long, twisting finish that goes on for miles: vegetal roasted chili peppers, sweet creamy butter, fresh tropical fruit, Dutch cocoa, hazelnuts, earthy minerality. These elements are there in good tequila, also – just softer, rounder. Mezcal is bold, wild, and invigorating. All this love for agave helps boost the local economies in Mexico and shines a light on a fascinating culture, but it may come at a cost. I’ve already mentioned the threat to biodiversity and habitats, but there’s also a power grab coming from Mexico’s governing standards bodies that would give power to the mega-corporations that are mass-producing tequila and would eliminate the ability of small-batch producers to make a living. Even worse, some desperate and short-sighted farmers in Oaxaca have begun selling truckloads of immature agave to big-name mixto tequila producers to help satisfy their market demands – at the expense of mezcal’s future (and theirs). For more on these issues, please follow the Tequila Interchange Project and sign their petitions that come up every so often as these damaging initiatives attempt to become regulations. But in the meantime, support small, independent producers, enjoy these amazing spirits neat or mixed – and help keep this world alive.